If you're ready to switch everything over to ConvertKit, and stop paying for multiple tools, you're in luck. For the integration to work properly, you need a ConvertKit account, an active version of WishList Member installed on your site, and an activated ConvertKit WordPress Plugin. Now that you've hooked up WishList Member and ConvertKit, we need to make sure WishList member isn't pushing Subscribers anywhere else. Ideally, you shouldn't have to be paying for more than one email tool! 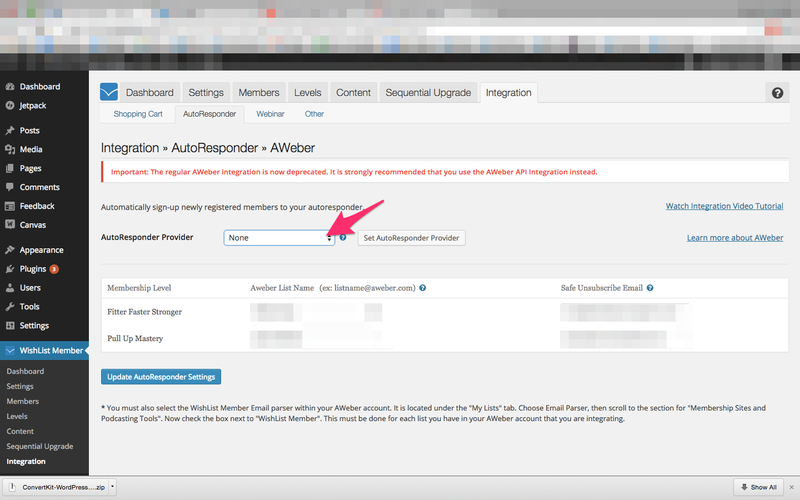 Disabling your current autoresponder is easy. All you have to do is click WishList Member in your WordPress sidebar, click AutoResponder at the top of the page, and choose None in the AutoResponder Provider dropdown. Once you've saved your changes, WishList Member will push Subscribers to ConvertKit exclusively, and your customers will seamlessly enjoy the content they've signed up for, without having to take any further steps to access it!